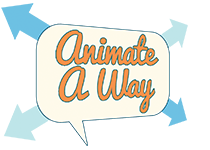 Animate A Way is excited to launch it’s new web presence. The new school year is here and we’re looking forward to meeting our new group of advocates against domestic violence! New Name / New Website! Animate A Way and Girls! Camera! Action! (which was formerly just Girls! Camera! Action!) is happy to be here on the web. We look forward to keeping you up to date with everything we are doing in all of our programs. Be sure and check often for the latest videos as well as info and dates for our awesome exhibitions.